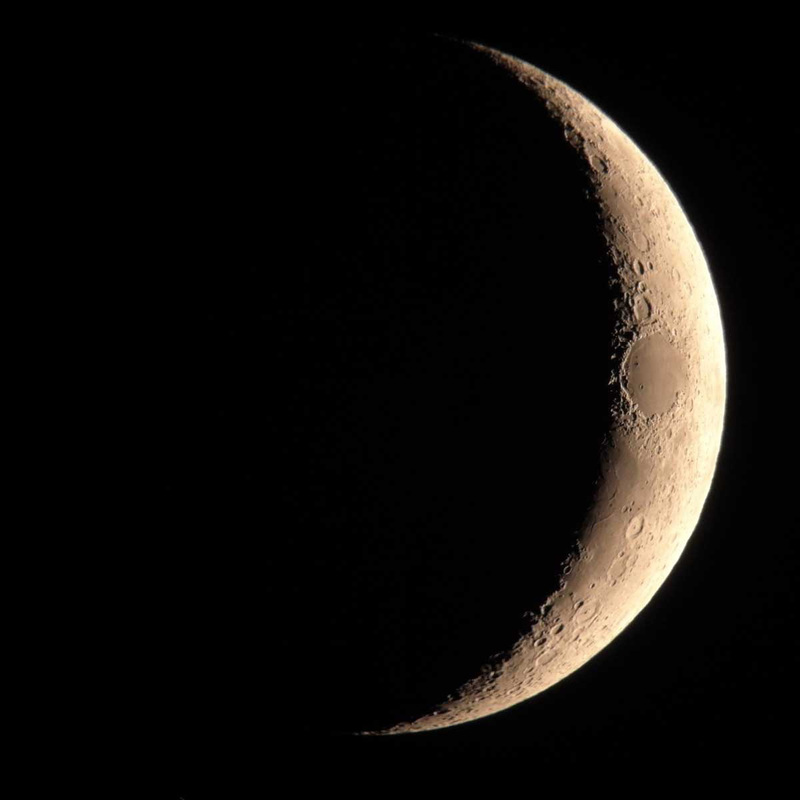 On this page, the moon is a crescent. The following photos show the moon on the third night after new moon, which is probably called the "third" night. The photos are rotated by 180 degrees so that they correspond to the normal viewing impression. Only the photos taken with the GSD680 telescope are really useful for the "moon walk," because they have a much better quality than the photos taken with the small Heritage 100P telescope. The latter are, however, also shown for comparison. 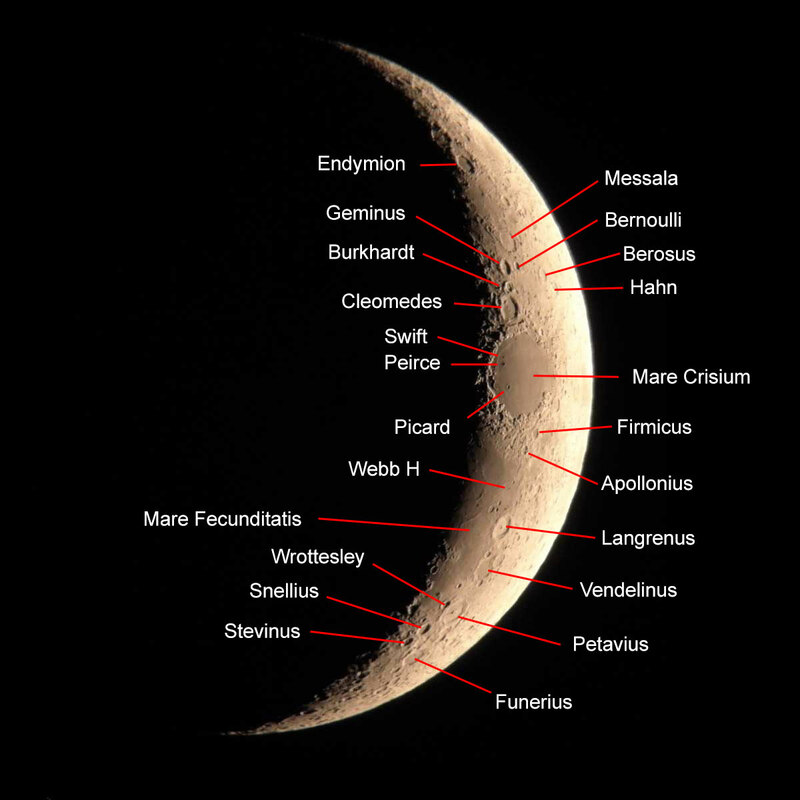 The Crescent Moon is dominated by the Mare Crisium in the middle. A chain of larger craters runs below it to the south. 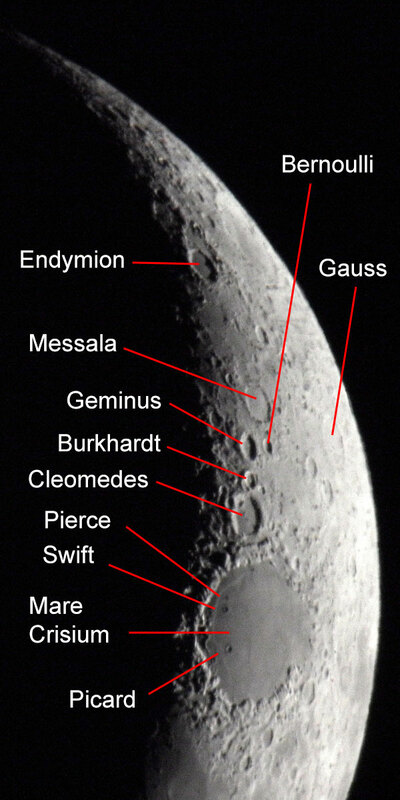 Above it, there are also craters, but only a few of them are named on my maps. First, a photo taken with the 8" Dobsonian telescope GSO GSD680 and with the camera firmly attached to the eyepiece (April 10, 2016; third day after New Moon, which was on April 7, 2016 shortly before half past 12 a.m.). 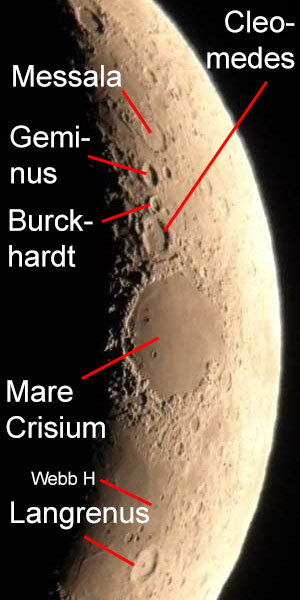 On these photos, you can see craters down to a diameter of 10 km (for example, Webb H). 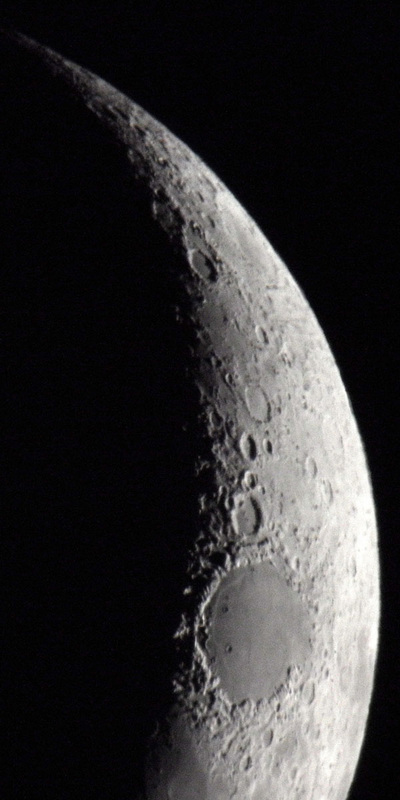 Next, a photo taken with the same telescope, but with the camera held to the eyepiece (April 10, 2016; third day after New Moon, which was on April, 7, 2016 shortly before half past 12 a.m.). Since the eyepiece had only half the focal length of the previous one, the magnification is doubled, so that only a part of the crescent moon is visible. 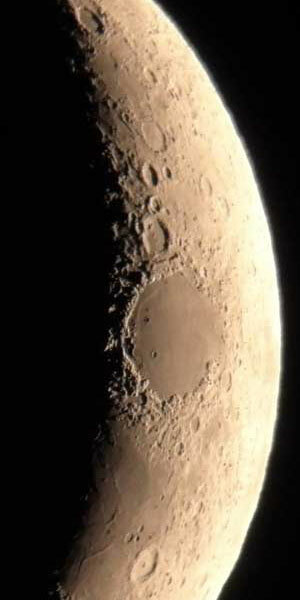 The resolution should be the same as for the photos above (down to craters of a diameter of 10 km). 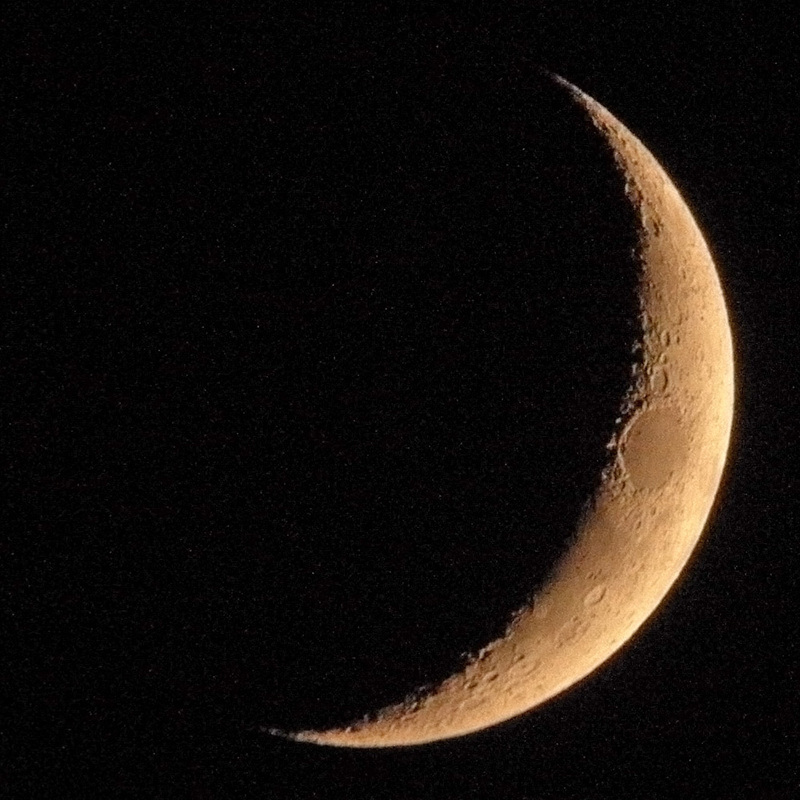 For comparison, a photo taken with the small 4" Dobsonian telescope Sky-Watcher Heritage 100P. 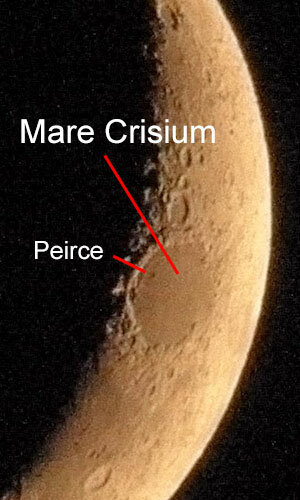 Here you can just recognize the crater Peirce having a diameter of 18 km (see large versions).